As College Bribery Scandal Plays Out, Here Is Some Context It's no surprise that rich people game the system to get their kids into top colleges. Here are some key takeaways as the bribery scandal evolves. Yet federal prosecutors say that for 33 wealthy parents, these advantages were not enough. A college consultant named William Singer, of Newport Beach, Calif., pleaded guilty in federal court Tuesday to a cheating scheme that included bribing SAT test proctors and college coaches on behalf of these families. The indictment names prominent actresses and business leaders. It alleges crazy stunts — like having a stand-in take a college entrance exam, photo-doctoring to paste a student's head onto the body of an athlete, bribing college sports coaches and paying up to $75,000 for falsified exam results, all in the name of getting their kids admission through what Singer called "a side door" to schools like Yale University, the University of Texas at Austin and the University of Southern California. To better understand this story, here are a few things to know about the fraught history of college admissions. Just a fraction of U.S. students attend schools like these. The majority of the schools targeted in this scheme are selective: The University of Texas at Austin takes four in 10 applicants, and Yale just 7 percent. Yet the average U.S. college accepts two out of three applicants. That means this demolition derby of highly competitive admissions just doesn't apply to most Americans. Universities are tax-exempt and taxpayer supported through federal aid and, in the case of public institutions, state funding. That status is granted because they profess a public mission. Selective institutions justify effectively barring the masses because, they say, they admit students based on merit. When a high school junior in Spokane, Wash., or Sutherland Springs, Texas, goes to Yale's application website, she reads this: "As we carefully and respectfully review every application, two questions guide our admissions team: 'Who is likely to make the most of Yale's resources?' and 'Who will contribute most significantly to the Yale community?' "
The existence of legacy admissions and even athletic recruitment puts a dent in this shiny image. This bribery scandal could tarnish it for good. A detail that some critics have found especially galling: In some cases, payments that were effectively bribes to university officials were funneled through charitable foundations to the universities, meaning that the bribers also could claim tax exemptions. This controversy comes amid a broader debate over affirmative action. Last year, Harvard University's admissions process — and the very concept of merit at the most selective colleges — was put on trial. Asian-American students alleged discrimination because they are consistently admitted at lower rates than their SAT scores and grades might predict. Harvard denies the allegations. At stake are the procedures that elite, highly selective colleges, which are generally overstacked with white and rich students, try to use to improve diversity without running afoul of the law. Despite battles over affirmative action stretching back decades, research has shown that low-income students make up just 3 percent of America's most selective colleges and that racial diversity is lacking too. These inequities in American education go back all the way to kindergarten. Access to college counselors and advanced courses is inequitable by class and race. According to a recent report from the nonprofit EdBuild, predominantly white school districts as a group receive $23 billion more than districts that serve mostly students of color, though both have the same number of students. 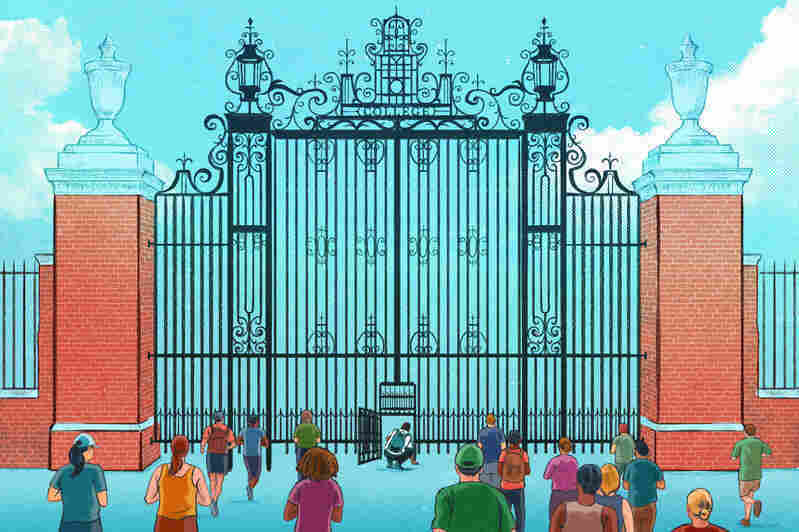 Highly selective colleges have dubious advantages. With all the general cultural brouhaha over getting kids into a "good school," which now extends to charges of federal racketeering and wire fraud, you'd think that a fat admissions letter is a golden ticket to a great life. The answer is yes and no. Low-income students who do manage to get into top colleges graduate at high rates and do nearly as well financially as their silver-spoon peers. But the colleges that most excel in promoting social mobility, according to an analysis by economist Raj Chetty, aren't the Ivies — they are excellent, open-access public institutions and community colleges with large numbers of working-class students, like the City University of New York. All else being equal, highly selective colleges do seem to confer an income premium over nonselective colleges. But an individual's choice of major, such as engineering, is a far more powerful factor in her eventual earnings than her choice of college. CEOs, on the other hand, come from a broader mix of public and private institutions, with only 14 Ivy Leaguers among the top 100 companies in the U.S., according to a U.S. News & World Report analysis last year. Meanwhile, many tech billionaires are better known as college dropouts. No word yet on what it means for long-term happiness to find out your parents lied to get you into college in the first place. NPR wants to hear from anyone who has received advice from the man at the center of the college admissions scandal, William Rick Singer, and any of his companies — The Key, the Key Worldwide Foundation, Future Stars, the CollegeSource or others. Fill out the form below or here.